I was quite excited to read this book, mainly because I couldn't get my hands on Deborah Moggach's These Foolish Things which the film The Best Exotic Marigold Hotel is based on. Since there has been talk that her novel, Tulip Fever, might be made into a movie too, I thought it would be a good second choice. 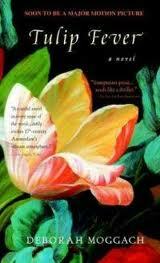 Except These Foolish Things is a contemporary novel. Tulip Fever is not. Tulip Fever takes place during the 17th century at the height of Tulipmania. Tulipmania was a period in Holland's history when speculating and trading in tulip bulbs went berzerk - much like our recent real estate market - and solitary tulip bulbs sold for insanely high amounts - several times more than the annual salary of certain skilled tradesmen. Like our real estate market, the bubble burst, and many people were financially runied. This was news, as they say, to me and I found that factoid incredibly interesting. Supposedly the economists still used the term "tulipmania" to indicate a potential bubble-like economic market! Sophia is the beautiful young wife of Cornelis, a wealthy and much older man. He engages an artist to paint their portrait and Sophia and the artist, Jan Van Loos soon begin an affair. The story was a fairly predictable love triangle, with mistaken identities and botched plans almost Shakesperian in intent. Sophia's maid Maria, gets pregant by her lover, Willem who thinks she is the one having the affair. The artists's assistants do their part to put a wrench in things too. While the novel isn't really about the tulip market, the potential money from trading in tulips does contribute to Sophia and Jan's plans to be together. At times the events were almost farce like except that there was little humor in the book and I couldn't help wondering if it would read better if it was written more broadly. I think my biggest problem though, was that I didn't like or respect Sophia, and I found her decisions increasingly frustrating. As much as the tulip speculators were feverishly pursuing their bulbs, so are Jan and Sophia, pursuing their feverish sexual passion. I'm not a prude, or at least I don't think I am, but I simply didn't didn't want to read about them. I think for Moggach to be successful I should have fallen a bit in love with the artist too, should have wanted Sophia to leave the old man. Instead I felt sorry for Cornelis and a little disgusted with her as well as Jan. I could hardly wait to be done with it! I usually like historical fiction and while Moggach has set the book during an interesting time period in Holland's history, both the writing style and the story itself didn't work for me this time out. I really hope I like the book These Foolish Things better! I did like These Foolish Things aka The Best Exotic Marigold Hotel better! I've heard of tulipmania but don't really know anything about it - I bet this book is fascinating! The tulip mania aspect was fascinating, as was the glimpse at art of the period. I just wish I had enjoyed the story and characters more.